Ah, the ritual of corny classroom Valentine's Day card exchanges. Every year, millions of kids think long and hard about giving the perfect card with just the right message. You don't want one that sends the wrong idea to the booger-eater who sits next to you. And you certainly don't want to let your latest crush know how you really feel. It's a major source of stress. 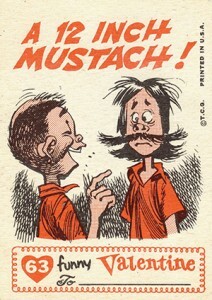 1959 Topps Funny Valentines cards riff on the tradition with silly gags, fun artwork and a bit of a rebel attitude. 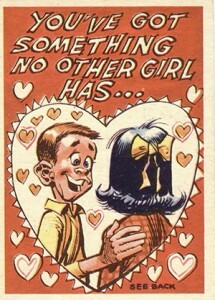 At first glance, the 1959 Topps Funny Valentines releases look like the ideal Valentine card. The artwork, done by cartooning legend Jack Davis, is bright and flattering, and fronts have a pleasant message. But then you flip the card over and the gag becomes apparent. Done with healthy doses of wit, sarcasm and puns, the trading cards become lighthearted burns ideal for those who carry cooties and even annoying sisters. 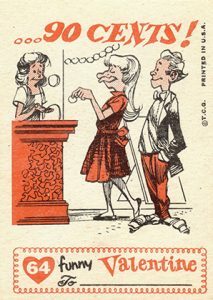 Not too difficult of a set to make, 1959 Topps Funny Valentines has a 66-card checklist. Despite their age, they're extremely affordable, even top-condition copies inspected by professional grading companies like PSA. Topps followed up the first series with a similar release in 1960. The second series is easy to differentiate because the numbers are accompanied by an 'A' (1A, 2A, 3A, etc...). Giant Size Funny Valentines came along in 1961. 66 cards. Shop for base cards on eBay. 5 Stay Just as You Are! 27 There Will Never Be Another You! 40 Why Can't You Love Me? 48 You've Got Something No Other Girl Has!!! 54 Won't You Come Over for Dinner? 55 You Have a Wonderful Personality! 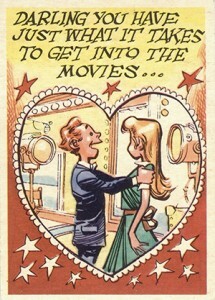 1959 FUNNY VALENTINES #44 SOME VALENTINE DAY ADVICE... PSA 8 !! NM - MT ! !